you know I hear some folks comments about the amp going out. Very pleased with my foundation shaking speakers. love this speaker. I turn it off when done. Maybe these guys leave theirs on all the time or are trying to cause an earthquake in the neighborhood. Sounds good as the day I bought it. I just got this sub and it sounds superb for a sub $500 sub. I have owned other JBL products (control room, PA, and home speakers) and this is consistent with their sound quality. I'm not sure what year my sub is. I have read the reviews with problems and this is unfortunate. The culprit appears to be a bad amp, and more specifically units manufactured in Mexico, according to another post. I bought mine on ebay from a happy owner without problems, and it is marked as manufactured in Canada. I find it unfair that JBL doesn't deal with this and I would be pissed if I was unfortunate as many others. This hurts the JBL brand and mares what is a good product (the working ones). Sorry and goodluck to those with lemons. For those considering this sub for purchase, look for the Candian made ones, and get it at a great price because of this fiasco. Wonderful Bass. Shame I'll have to get a replacement. Had this sub for about 5 years. After about 1 year, the amp died. I sent it off to have it serviced (only paid shipping for 1 way) and thought nothing of it since it was damaged while I was living in the college dorms. About 1 week ago (beg of June 2006), the sub died again. I tried to call JBL but spent 30+ minutes on hold 2 seperate times. Finally resorted to email and got a prompt response. Am in the process of investigating options. I won't bad-mouth this sub because I've been very impressed with its performance. I love JBL to death and will probably take them up on the E250p replacement option. I've also got a JBL S-center, which is absolutely beautiful. Take it for what its worth, but I'm not letting a manufacturing defect turn me away from a company. Things like this happen and trust me, JBL probably isn't having such a fun time covering for all of this anyways. I rated this 4 stars because I truly believe that those not involved in the defect run (serial number not beginning with AM) are wonderful and perform very well. Phone service is HORRIBLE. Email service has been pretty good to this point. This sub will eventually die on you. Get something else. My amp died after a couple years of use. Do NOT buy this sub. It will die on you! Powerful sub for movies and music. Big bang for the buck. Some production defects, careful placement necessary. As a musician I always preferred JBL for PA system drivers and have loved the JBL sound for audio as well. When deciding to upgrade my HT I looked for all JBL components. I was unaware of the controversy surrounding this model and purchased one for $150. 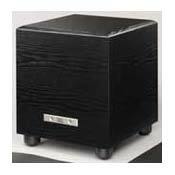 I loved the kick it gave my system and it doubled the wattage of my previous RCA 100w 10" sub. I later saw a DOA PB12 on eBay for $35 and bought it thinking I could fix it. Well, I couldn't but JBL did for the cost of shipping one-way! Some research led to the myriad complaints about this model. The amp section is the culprit, and only some of the production run that were assembled in Mexico (the "M" in the "AM" prefix in the serial numbers) are a problem. Of course, I would have preferred to go with the Studio Series subs at 400w, but even now I can't justify $300+ for a single component. These subs have massive sound for the money and can be had for next to nothing these days. I do feel the down-firing design is a problem if you aren't really aware of room placement and the surface that it is placed on. I have a carpeted room and placed pieces of plexiglass under these units to tighten up the bass. I also added a JBL ARC SUB 10 for the mid bass punch, as this is a forward firing unit. All in all a great value if you are aware of the possible pitfalls. Great for the 2 years lifespan. This Sub sounded great up till it died from the well known "hum/blown fuse" syndrome. The serial started with AM which apparently is the kiss of death for this sub model. I called support and they told me what they are offering people know is an upgrade to the newest 10" or 12" model which is completely redesigned. I get 60% off the price (how very white of them). All I have to do is mail them a copy of the receipt, the cone from the speaker (to make sure it's dead I assume, and the cut off cord. I'm sorry but if I do go with this deal it will cost me around $210.00..that's an upsell not an answer to the problem that it was a known defect. Someone mentioned Class Action on this...might be a good idea. Deep Powerful bass, good for both movies and music, powerful built in amp (250W RMS)cool looking lights and casing. Sometimes a little too boomy with certain types of music (rap, techno). This sub is a great product by JBL. I have read many reviews about the PB12 and people's bad luck with amps going bad but i have had no problems with it so far. This sub can hit some very low frequency notes and the bass is excellent with movies. It can be a bit boomy with some music (especially rap and techno)but when the output level on the back is turned down a bit the problem solves itself. This sub compliments my main speakers well and its Phase control is a helpful device when it comes to that. Always performs better in a corner. When its really loud the lights flicker a bit. I dunno if this is bad for it so I deffintly try not to do it. Good damn! This thing as massive PUNCH. I have it on right now and im in my computer room 2 rooms away and i feel the floor and walls going nuts. When you blast this sub it holds up really well. Sounds awsome with movies. Matrix was really awsome on it. Music is great too the drums will never sound the same again. Lights look really nice too. Bought this Sub over 3 years ago to replace a Audio Source sub and I have so far had -0- trouble with it.I upgraded my whole system to a 6.1 system with Polk RTI-38 mains and CSI-30 center channel and Cambrige Sound Works rears driven by a Onkyo TS-XR701 reciever,the only part of the system I kept was the JBL sub and it blends in well with the whole system,very good for movie soundtracks , techno and rock music.The amp powers down to standbye fine and I have no buzz from the system. It is a good mid level mid-fi sub for the money.